When Alyssa Ertel was 15, she got a phone call from her mom, who was at the hospital, crying. Her younger brother Nick, age 14 at the time, had just been diagnosed with Type 1 diabetes. From then on, every night at dinner, Ertel’s brother pricked his finger to measure his blood sugar and injected himself with insulin. A high school student in Kennewick, Wash., the diagnosis transformed Ertel’s chemistry class from just looking at cells under microscopes to something more immediately relevant. Ertel’s interest in the chemical processes that produce drugs piqued. 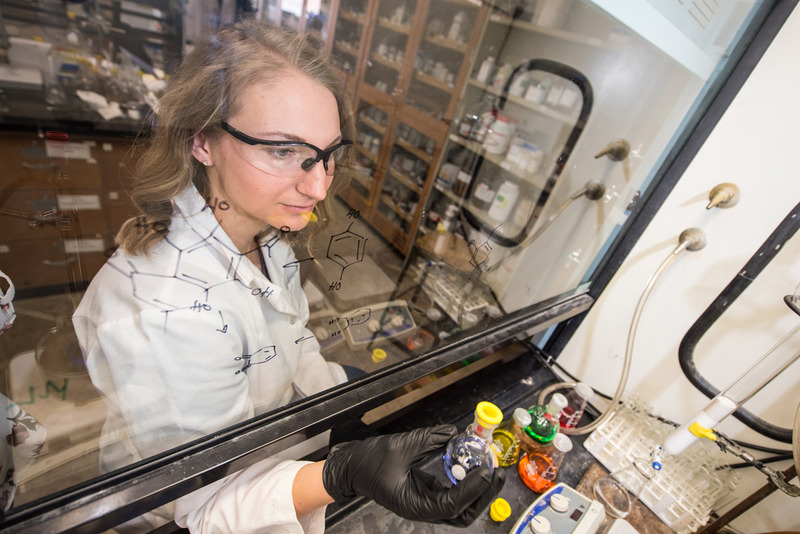 This May, Ertel — a University of Idaho Honors Program student, Engineering Scholar and 2016 Goldwater Scholarship recipient — graduates with dual bachelor’s degrees in chemical engineering and chemistry from the College of Engineering. She’s been accepted to doctoral programs in chemistry at Princeton and the University of California, Berkeley. Ultimately, she wants to develop more efficient chemical processes for creating safer, cheaper and environmentally friendly pharmaceuticals that will help save lives, much like insulin increased her brother’s quality of life. Ertel became interested in opportunities within the pharmaceutical industry during a summer 2015 internship at John Hopkins University’s Institute for NanoBioTechnology in Baltimore, Maryland. She researched self-assembling bioelectronic materials, or molecules designed for the human body with a bioactive exterior, meaning their properties affect living tissues. Ertel researched the materials’ capabilities in binding to cells to monitor and control stem cell differentiation, and the effect that temperature plays on the materials. The opportunity to participate in research and internships like the one at John Hopkins is what drew Ertel to U of I. In fall 2015, Ertel began working in Assistant Professor Jakob Magolan’s chemistry lab on a project that uses activated alumina to promote chemical processes that typically consist of potentially toxic compounds. Activated alumina is a porous material manufactured to keep things dry; it’s used in prosthetics to cover surfaces that create friction between the artificial limb and the body. Now much of the work Ertel does in the lab entails synthesizing molecules, studying their reactions and exploring their potential for applications in drug development. Besides pharmaceuticals, Ertel has another option to consider, though. After a summer 2016 internship with BP Exploration Alaska in Anchorage, she was offered a full-time job there. Ertel estimated that she was one of three women on-site when she toured BP’s facility in the Arctic Circle, which employs hundreds of workers. Because of her work as president of U of I’s Society of Women Engineers, however, and having served as a role model to young girls at the society’s K-12 outreach event in Philadelphia in 2015, Ertel knew how to exude confidence in such situations. Ertel is still working to decide between a graduate program in a field she’s passionate about and the security of a full-time job. It’s a good problem to have. But a difficult choice, nonetheless. What Ertel is sure of, however, is her desire to make a difference. Last year, Ertel’s brother passed away at age 20.